Adirondack Lifestyle ™: Happy Fall in the Adirondacks! I consider August 1 the first day of Fall in the Adirondacks. My friends and family who don't live in the Adirondacks think I am exaggerating, that it does not really get that cold here, or that the leaves do not start to change in late July or early August. 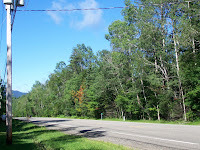 So, just to make a point I have posted today's photo of leaves changing on the Van Hoevenberg Road already. Of course, the point is if Fall has arrived, then snow (and skiing!!!) can't be too far behind. Psyche! !